Australian businesses are spending more than $2.2 billion each year on waste services, of which $1.4 billion is spent on waste to landfill. Approximately 12.5 million tonnes of Commercial and Industrial (C&I) waste is generated each year, which is equivalent to 543kg for each Australian. Of that, almost 7 million tonnes is sent to landfill, equating to an average C&I recycling rate of 46% across the country. As waste disposal costs increase, it makes financial sense to look for recycling options for the wide range of waste materials generated by businesses. 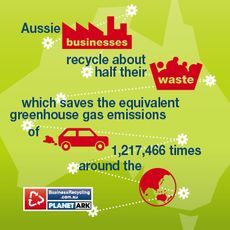 Counteracting the large amount of waste and its associated costs to businesses and the environment is a key aim behind Planet Ark Environmental Foundation’s BusinessRecycling.com.au. It’s a free online directory and hotline specifically designed to make it easy for Australian businesses to find local recycling services. BusinessRecycling.com.au contains 6,676 listings of re-use, recycling, collection and drop-off locations and services across the country for more than 90 different materials. Many businesses find that recycling their waste can be equal to, or even cheaper than, sending it to landfill, in addition to the non-financial benefits of demonstrating good corporate responsibility and boosting staff morale. “Australian businesses are getting better at recycling, making great use of programs such as ‘Cartridges for Planet Ark’ and Mobile Muster, but we are still throwing away huge amounts of valuable materials each year,” says Janet Sparrow, Recycling Programs Manager at Planet Ark. BusinessRecycling.com.au is made possible through the support of Foundation Partner NSW Environment Protection Authority, and the Victorian Government. It is also supported by Zero Waste South Australia and MobileMuster, the Australian mobile phone industry's official product stewardship program.